Ability to copy and paste only the associated values, formatting, formula, data validation, or conditional formatting. Hide toolbars and headers to view more content at one time in Sheets. Starting with Docs and Slides, Android users can now use the text formatting palette to add superscripts and subscripts to text in their Docs and Slides. They can also insert links directly into their presentations right from the toolbar of Slides Android app. Sheets Android app has also been revamped allowing users to do more with their spreadsheets on the go. For instance, the new pasting feature allows you to ‘copy content and then paste only the associated values, formatting, formula, data validation, or conditional formatting. 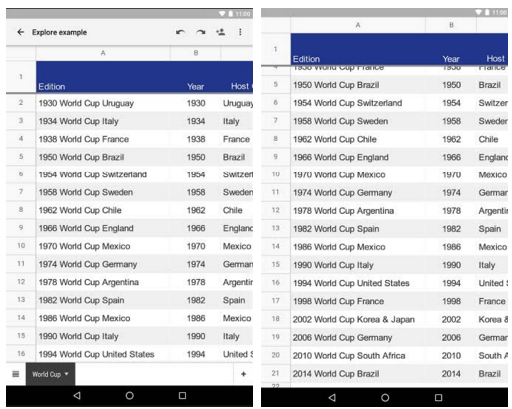 You can also paste everything but borders or paste your content in a transposed order.’Additionally, Sheets android app users can now see filters they have applied to data in Sheets on the web. The app’s interface has also been reconfigured so that users can scroll down or zoom in on a spreadsheet to hide toolbars and headers and view more content on the screen.